November 21, 1965. A small frail young girl appears on French television screens. It wasn’t even a year later that her name was known all over the entire country. Then the rest of world met her, and people started talking about her fairy tale without any exaggeration whatsoever. Born in the noble papal city of Avignon, Mireille would see 13 little brothers and sisters appear and grow up with her. Monique, Christiane, Marie-France, Réjane, Régis and Guy (twins), Roger, Jean-Pierre, Rémy, Simone, Philippe, Béatrice, and least but not least, Vincent. Her father Roger was a stonecutter for the cemetery; he also had the dream of becoming a singer, possessing an admirable tenor’s voice. The family lived in a wooden shack that leaked when it rained and the wind blew through the door and the windows. It wasn’t the gayest of scenes! When Mireille was 15 years old, they moved into a government subsidized apartment with five rooms, and a new luxury: a bathroom.That was the most beautiful day in my life, Mireille remembers, for the first time, I took a bath!. It was such an extraordinary sensation. Every morning, Madame Mathieu went to the market and very carefully calculated her choices. Every franc counted, and Roger Mathieu earned only 200 francs a week from his father, the boss of a modest family business. All in all, the Mathieu household saw no more than 1,800 francs a month and 190 francs had to be subtracted for the monthly rent. Quite often, there were moments when Marcelle Mathieu felt a migraine coming on when managing the family finances, especially when she had to buy a dress for one, underwear for another, shoes for everyone. As Mireille was the eldest of the children, she learned very quickly how heavy her responsibilities would be. Every room was neat and orderly. At our house, you could have eaten off the floors!, says Mireille with admiration. Roger Mathieu was an excellent worker who wasn’t afraid of sweat and tears. Vacation? Diversions? These are words that the Mathieu family hadn’t had in their vocabulary. “I was four years old when I sang in public for the very first time.” It was for Midnight Mass. After listening so often to the great singers on radio and on television, Mireille dreamed of becoming a famous singer like these men and women. She wanted to sing before an audience other than her family or her school friends. Edith Piaf was her idol, her model. During her sewing classes at school, her friends would ask her to sing La vie en rose. By accepting Mireille as a student, Laure Collière, a voice instructor, couldn’t help telling Mireille that the singing profession had many more people who were called than actually chosen. “You know” she would say,”to be a singer, you have to be strong, both physically and morally. You have more of a chance of ending up in a haystack than you do on the pillows of a Rolls Royce!” “I’m sure you’re right”, Mireille would respond, “but the one who doesn’t take a risk never wins!”. Johnny Stark, professional manager, sees in Mireille an unbelievable talent, but while he acknowledges it, he warns her: “Don’t forget that you’re a beginner. Put it in your head that I’m going to make you work like a horse, that I won’t let you get away with anything, and that I will be ruthless. Think about it, you still can say no. If you want to listen to me, to work really hard, and go at a levelheaded pace on the road to success, I will make you really good, really great, a veritable star”. He knew that, whatever happened, she would hang on, since she’s a fighter who thinks singing is more important than anything. Johnny placed Mireille in the hands of the orchestra leader Paul Mauriat who teaches her not to “howl”, as Stark would say. And then there are rehearsals, photo shoots, interviews that Stark would never miss, music lessons, singing lessons, dancing lessons, French and English lessons, and gymnastics. Stark still would say that Mireille’s extraordinary success, and the incredible speed at which she would become so famous so quickly was hardly miraculous. She likes work for work’s sake. At the peak of a heavy schedule, intensive and numerous recordings, such as when she began doing promotions in the United States, Mireille only slept four hours a night, and would make up for it later. Her motto, the religious person that she is, became: “My God and My work”. Finally, on Saturday the 15th of March, she taped the Ed Sullivan Show, the most popular television program in the United States, with an audience of 50 million. When the show is aired the following Sunday, the reaction is very successful. 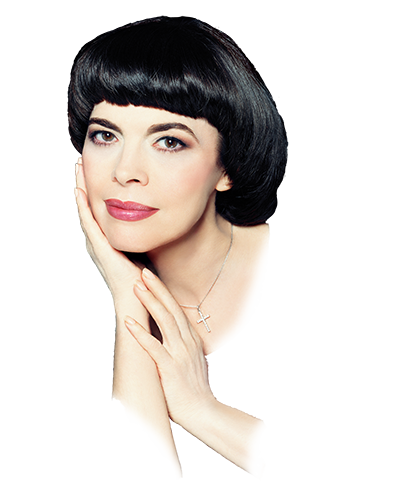 All of America, struck by voice of the songbird from Avignon, has the name Mireille Mathieu on it’s lips. Then it’s Las Vegas, Hollywood, tons of interviews, phone calls, invitations… In New York, where she is the guest star of the Merv Griffin Show, Mireille is a big hit. She always sings about love. “Music is the best way for me to say I love you”, she admits. She exteriorizes romance, which is in the heart of ever girl, and Mireille is no exception. “My songs always speak of love, that’s the way I like them”. Mireille Mathieu has sung before every type of audience, in nearly every country, she is loved by the simple folk just as much as by the big names in this world. She has been received by heads of state and has traveled the four corners of the world. “Where she feels the most at home”, Johnny Stark used to say, “is on stage”, adding, “There she is all by herself, and it’s there where she finds peace”. “In the life of a singer”, she declares, “it’s not all triumphs and happy memories; there are days when you have to go out there when it’s the last thing you feel like doing. You also have to smile when your heart is elsewhere due to some unhappy event, and you just have to keep it to yourself. Then there’s the fatigue that you have to forget about because the red curtain still has to rise. It doesn’t matter if you have a desperate heart when you have to sing about joy; it doesn’t matter if you’re scared to death when the lights go on”. Such is Mireille, a heart that sings, a heart that sheds tears… but above all, a heart that loves. Her father Roger, who died in 1985, and her manager Johnny Stark, who left this world in 1989, would both be so proud. Mireille continues to sing , with the help of her sister Monique, who never leaves her side, and her faith in God. After forty nine years , the heart of Mireille continues to enchant the globe.